When you have a busy week, sometimes it’s very difficult to eat healthy, delicious food. So I was on a mission to not be tempted by fast food or take out. 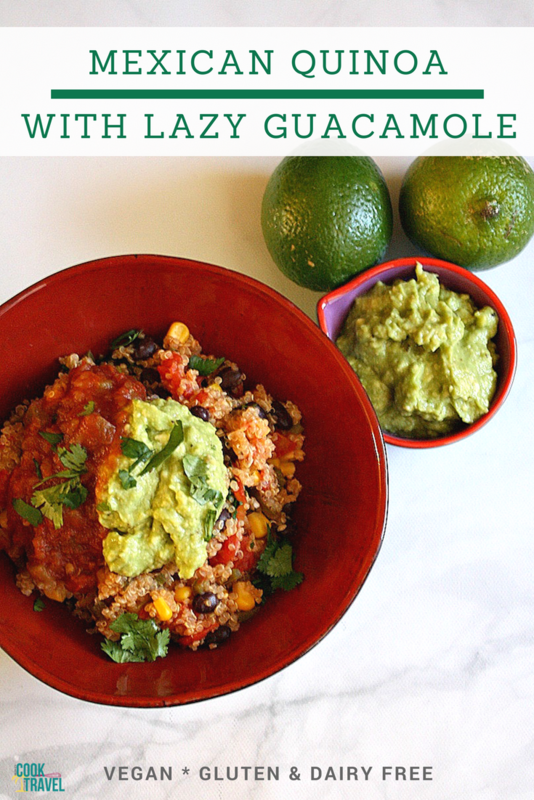 I realized it had been a while since I’d made a quinoa dish, so when this one found me on Pinterest, I was sold…Mexican Quinoa and Lazy Guacamole. Yum! So what makes this Mexican Quinoa dish different, you’re wondering? Well a few things. First off, 2 jalapeños are a good start. The jalapeños add a nice kick without the dish being too spicy, and then the quinoa cooks with the vegetables and chicken stock. Often the quinoa cooks in salted water and then stirs into other ingredients. I liked this idea better, because it really helped infuse the flavors into the quinoa. So there is a definite Mexican take on this dish. Black beans, jalapeños, tomatoes, and corn help give the quinoa some great character. And instead of water, use chicken broth or stock to infuse even more flavor into the quinoa. If cooking with quinoa is new to you, then it’s time to get started! Quinoa is a grain that is incredibly healthy and also takes on the flavors of whatever you’re cooking with. Then just top it with your favorite things like cheese, sour cream, guacamole, and salsa. Sadly my cheese and salsa expired, so on my first attempt at this dish, I used, believe it or not, some grated Parmesan cheese. And it was actually really good. Then add a bit of sour cream and guacamole to the Mexican Quinoa. The most recent time I cooked this Mexican Quinoa, I went for a dairy free option. I made this delicious and ridiculously easy lazy guacamole that has 3 ingredients, which just made my life easier. (You’ll find that recipe along with this quinoa recipe using the link at the end of the post.) And I added some of my favorite medium spice level salsa plus some chopped cilantro. And honestly, I didn’t miss the cheese or sour cream at all. I have to say this was fabulous. I made it over my lunch break one day with time to spare this week, and that’s always a great selling point for me. 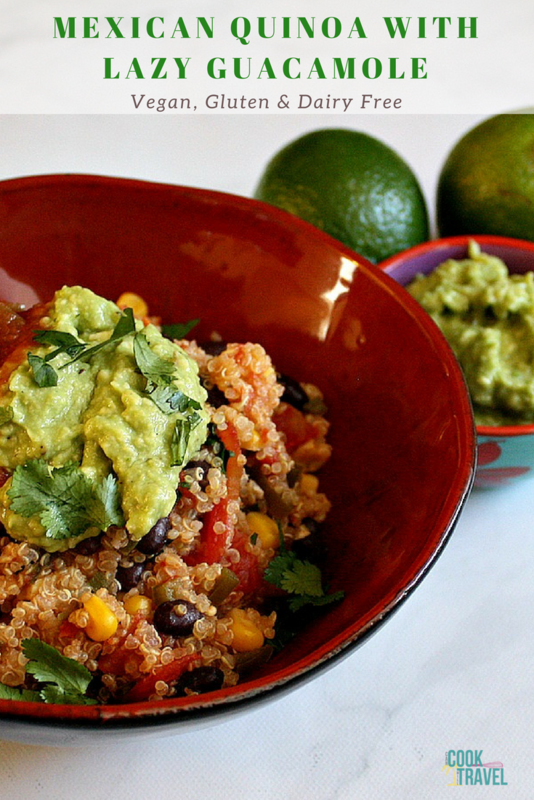 So go on and enjoy this easy Mexican Quinoa dish. I particularly loved how it was reminiscent of a Spanish rice with the tomatoes and mild spice, but was way more healthy for you! 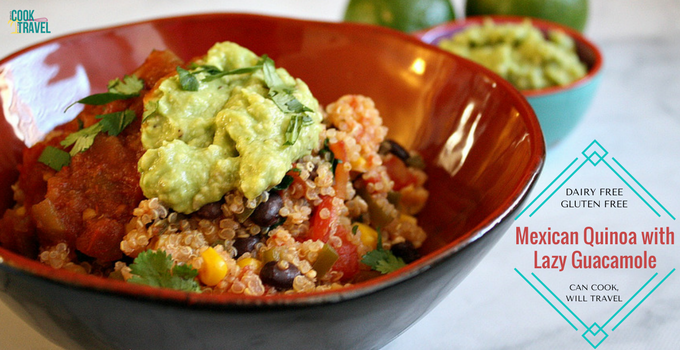 So when you’re ready for a quick and easy meal, look no further than this Mexican Quinoa recipe. Be sure to click that link for the recipe and step by step instructions!